“Ill fortune is better for men than good. When fortune smiles, she is always false. But when she is inconstant and whimsical, she shows her true self. The first aspect of fortune will deceive people, but the second is instructive. The first blinds while the second opens men’s eyes to how fragile the happiness of mortals really is. The man who enjoys good fortune is driven frantic, running this way and that and trying to maintain what he has. The other is steady and, if he learns from his experience, even wise. Good fortune can lead men astray, deceiving them about what to expect from life and how to think of themselves. When Fortune is unkind, she draws men back to an understanding of what the world is like, and who their friends are. Surely, in your time of trouble, you must have learned who were your real friends. The honest ones have been winnowed out from that crowd of associates and companions, all of whom have deserted you. What would you have paid them back then to know which were which and whom to trust? Here you are, complaining of the wealth that you have lost, and you fail to recognize the wealth you have gained – knowledge of your true friends” (pp. 56-57 of Slavitt’s work). 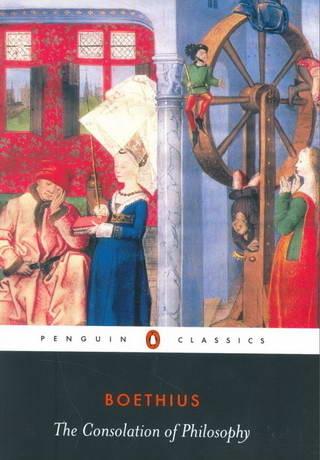 More on Boethius to come, especially his discussion of how divine foreknowledge and human freedom relate, which is what I find most interesting about his thought.